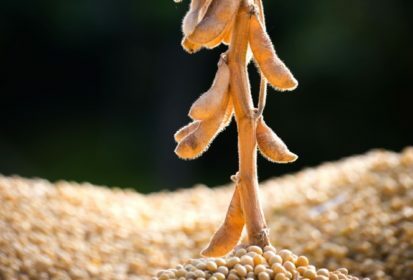 Chicago | Reuters – U.S. soybean and corn futures edged higher on Wednesday on declining crop conditions in the United States and forecasts for hot, dry weather in the western Midwest in the coming weeks. Soybeans drew additional support from rallying Chinese soy prices that signaled a possible resumption of buying by the world’s top importer of the oilseed. Wheat futures rebounded from earlier losses to close higher, lifted by global supply concerns due to weather-reduced crops in key producing areas worldwide. Grain traders squared positions and looked ahead to Friday’s monthly crop supply and demand reports from the U.S. Department of Agriculture(USDA). The report, the first of the season to include field surveys of U.S. crops, is expected to show larger corn and soy yields and production. However, recent dry weather in parts of the U.S. farm belt have tempered expectations. The USDA lowered its crop condition ratings for corn and soybeans this week, with the soybean decline dropping by more than expected. After rains this week, a warmer, drier pattern is expected in central and western corn belt states including top producers Iowa and Illinois, according to meteorologists. “There are some above-normal temperatures in the forecast and, with crop conditions coming down, there are some areas that are becoming a concern,” said Ted Seifried, chief agriculture market strategist for broker Zaner Group in Chicago. Chicago Board of Trade November soybeans gained 4-3/4 cents to $9.10-1/2 per bushel, while December corn added 1/2 cent to $3.85 a bushel. Concerns about an intensifying trade war with China hung over the soybean market after Beijing threatened retaliation for another round of U.S. tariffs on Chinese goods. However, analysts say U.S. soybean shipments to the world’s top importer could revive later in the year after China draws down available supplies in top exporter Brazil. China’s soybean and soymeal prices jumped on Wednesday, with beans posting their biggest daily gain in a decade, as data showing a drop in soybean imports stirred supply concerns. Wheat prices were buoyed by eroding harvest prospects in Europe, Russia and Australia. German farm cooperatives group DRV said the country’s 2018 grain harvest will be the lowest in 24 years. Global weather troubles have raised the prospect of additional demand for U.S. wheat. CBOT September soft red winter wheat rose 1-3/4 cents to $5.70 a bushel while September hard red winter wheat gained 4-3/4 cents to $5.84-1/4 a bushel. – Additional reporting by Gus Trompiz in Paris and Naveen Thukral in Singapore.